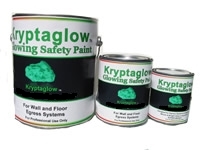 Kryptaglow Super Bright glow paint was developed for areas where a brighter longer glow is paramount. 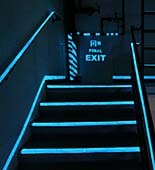 Super Bright glow paint can be used to make signs that will glow brightly for hours. And it lasts for years. This is the brightest paint currently in our line and can be seen at greater distances. Super Bright glow paint is available in Solvent Base or Water Base. 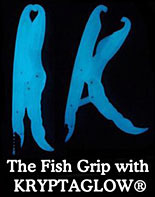 The Solvent based super bright glow paint has even been used underwater lasting several years without chipping, flaking or peeling. This can be seen in the pond pictured on our site. A HEAVY TRAFFIC AREA THEN PICTURE WAS TAKEN"
industrial paints in the country! We're Currently Looking For Dealers. 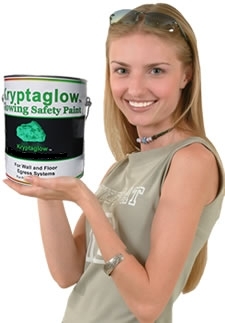 KRYPTAGLOW™ SUPER WALL AND FLOOR SAFETY PAINT. Solvent Base or Water Base. 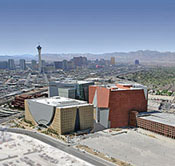 Used for just that wall and floor application and Egress systems. Used in combination with our Kryptaglow™ Topcoat enables it to be effective outdoors as well. Works best on a White base. Available in Gallons, Quarts and 12.8 oz spray cans. 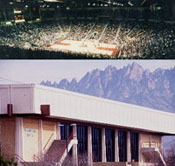 KRYPTAGLOW™ SUPER BRIGHT FOR SIGNAGE Super bright was developed for areas where a brighter longer glow is paramount. It can be used to make signs that will glow brightly for hours. And it lasts for years. This is line and can be seen at great distances and can be used for school- and home projects. Solvent Base or Water Base. KRYPATAGLOW™ CLEAR TOPCOAT. Used for sealing any of our safety paints. It’s specially formulated to absorb light and allow the fullest performance possible from Kryptaglow™ Safety Paints. KRYPTAGLOW™ Marine. There is always a need for a tougher paint for machinery and outdoors. NOW AVAILABLE! KRYPTAGLOW™ NON-SKID. Formulated for steps and areas where slipping may be a factor. Also in Water Base or Solvent for indoors or out. NEW! KRYPTAGLOW™ Plastic Dip. Formulated for dipping tools, handles, or any surface where a plastic glowing coating is needed. Can aid in preventing surface scratching between two metals. NEW! KRYPTAGLOW™ Automobile. This paint is formulated for automobiles, or motorcycles or any vehicle you would like to make glow. We have the undercoat as well as the top coat to complete your job. Kryptaglow® is a Registered Trademark of the Coleash Corporation. Any use or similarity to our name is a violation of trademark and copyright laws. Any use or copying of this site without authorization is strictly forbidden.